Operatic singing is not a musical genre usually associated with Goa, although the state is far more steeped in Western culture than most of India. 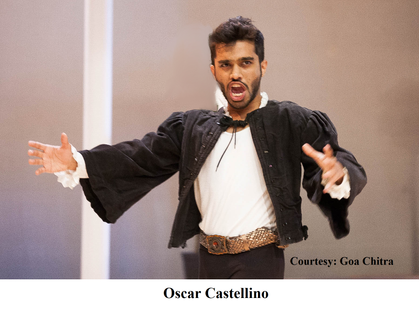 Oscar Castellino, who is performing at Goa Chitra Museum, Benaulim, on the 8th of March as part of his continuing Operawala Tour of India, brings his baritone voice to amaze and mesmerise his audience. In association with the Italian Embassy Cultural Centre, Oscar, or Operawalla as he calls himself, is commemorating the centenary of composer Francesco Paolo Tosti with a concert tour of India. An alumnus of the Royal College of Music, UK, Oscar Dom Victor Castellino already has an impressive body of work with roles as Mercutio in Romeo and Juliet with Opera at Bearwood; Dancairo in Carmen; Mahival, which is a lead role, in Sohini and Mahival, an Urdu opera at the Southbank Centre and others. He is, furthermore, scheduled to play the lead as James Meredith in Kommilitonen! with Welsh National Opera young artists in July 2016. Oscar had an inclination towards Western classical singing early on in life. It was the vibrancy and power projected through opera singing which required no amplification that captured his interest. He says, ‘Who is a bigger rock star than an opera singer who can floor an audience of a few thousands without any assistance? The Metropolitan Opera in New York has an audience capacity of 3,800.’ Though the grandeur of an operatic performance holding the imagination of the audience in its sway was the initial allure for Oscar, in time he grew to appreciate the finer nuances of classical music and this is what keeps him bound to opera. Constantly on the move as a singer, Oscar says, ‘A musician's life is one of a wanderer's, very well described in a German song by Hugo Wolf called Der Musikant (The Musician). For me living out of a suitcase is the best life.’ He has spent the last four months with his family in Mumbai, during the course of which he has had a successful show at St Xavier’s College (the Operawalla Tour of India). He hopes to spend more time in Goa in the future as he feels at home here. Oscar’s grandparents are from Assagaon. The turning point in Oscar’s life came when he attended a workshop by Patricia Rozario in 2010 in Mumbai, and the renowned soprano asked him over lunch if he would consider auditioning in London. ‘When an internationally acclaimed Soprano tells you that you have potential, there is no looking back!’ says Oscar. ‘Never had a question made me so excited.’ It was only his first workshop and it became his introduction into the world of classical singing. Oscar found Patricia Rozario to be extremely kind as a person. As a teacher, she works unceasingly towards seeing her students succeed, equipping them with a technique that is simple yet makes an impact. 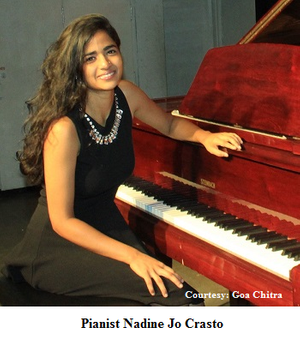 Besides, her own incredible ability as a singer par excellence inspires her students. ‘The teacher - student relation can be a tricky one, but Patricia is a great friend. She too has roots in Assagaon!’ says Oscar. Singing is not considered the most lucrative of careers unless you have a talent that surpasses that of most in the profession. Despite this, Oscar’s parents did not stand in the way of his musical pursuit. The time of reckoning is now, after he has completed his training and is involved in prestigious projects, but money is still limited. Being given the opportunity to sing at Queen Elizabeth II’s diamond jubilee was quite a surprise to the young baritone, who did not realise how significant the event was until it had ended. He and the other singers braved unpleasant cold and wet weather to sing at the occasion, ‘…hardly knowing that the whole world was watching us,’ as he says. He was also privileged to sing for Prince Charles when he was still at the Royal College of Music. The name ‘Operawala’ comes from his childhood travels by the Dehradun Express. He says, ‘A two-day journey and we were, you can say, serenaded by these chaiwalas who came to the window at each of the ninety-eight stations on the route.’ This captivated the young Oscar, who decided he wanted to become a chaiwala or a fruitwala when he grew up, but fate destined him to become an ‘Operawala’. He plans to do more work under this banner in Goa and the rest of India. The attitude towards opera in India differs depending on which generation the audience belongs to. There is a section of the audience comprising of the older generation who, with their longstanding following of opera, hold it in high regard. The younger lot are drawn to the appeal of performance art. Then there those in the audience who have no concept of the genre. An opera director in India has to keep all types of audience in mind. When Oscar sang Aeneas during the Giving Voice opera tour of India, the audience responded very favourably. More recently he encountered people who follow opera in the West and commended the high standard they witnessed during their experience of the tour here. ‘Rehaan Engineer, who was our director, is one of the best I have worked with,’ says Oscar.